Choosing a wedding date can be difficult; there are so many factors to consider! Have you decided to have a spring wedding? 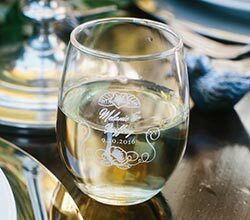 Here are four wedding ideas to keep in mind to plan a fabulous spring wedding. If having an outdoor spring wedding, it is always a good idea to have an indoor plan B, as snow and rain are not out of the question! Most wedding venues will have a back-up plan, so ask them to walk you through it while you’re touring the space. In an effort to prepare for unseasonably cold spring evenings, have heaters and blankets on standby. And for warm ones have tents, fans and water readily available. 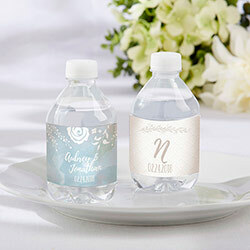 You can even purchase personalized water bottle labels to make it even more special! Many flowers will be in full bloom, so your spring wedding should be filled with fresh, gorgeous florals! Choose from peonies, roses, sweet peas, tulips, calla lilies and more. Your options are truly endless—and since they are readily available, the cost will be relatively low, making flowers the perfect spring wedding décor. Flowers can take part in many aspects of your wedding: from bridal bouquets to table décor and even favors. 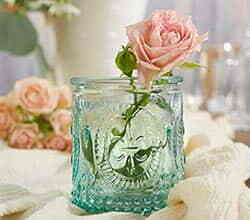 When placed in pretty jars or vases, simple floral arrangements are beautiful favors for your spring wedding. Pastels are very common in the spring, so why not use these soft and delicate colors for your spring wedding palette? You can incorporate these colors into your bridesmaid dresses, flowers, favors and décor. 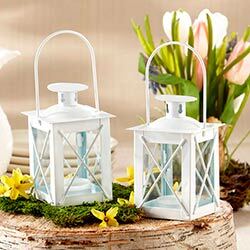 Mix light colored flowers with white lanterns to create the perfect spring wedding table décor. And stick with pastel hues and floral patterns for your décor and spring wedding favors. Are pastels not really for you? Try pairing them with bolder colors to make more of a statement. Bright, happy colors are another great option for weddings during the spring season. Spring is a wonderful time of year for a wedding. And by following these tips you are on your way to planning the most fabulous spring wedding of all.